When the populist politician Pim Fortuyn was assassinated two years ago, it was said the Netherlands had lost its innocence. 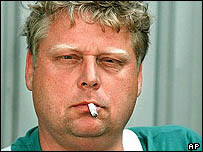 By comparison, film maker Theo van Gogh's murder has evoked sensations of déjà vu, rather than disbelief. But that does not mean the fall-out will be any less serious. 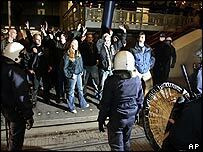 In 2002, the revelation that Pim Fortuyn's killer was a very Dutch environmental activist, and not a Muslim, had a sobering effect on the angry mobs who were ready to go on the rampage, torch in hand. But this time, there were eyewitness descriptions of the murderer's traditional Moroccan jallaba. And then there was the manner in which Van Gogh was killed: his throat was reportedly cut, bringing to mind the words of an angry Muslim only a few months ago that people like Van Gogh who blasphemed against Islam should be "slaughtered like pigs". "Today is the day I became a racist," was one of the typical reactions that appeared on Dutch websites on Tuesday, even before it had been officially confirmed that the killer was of Moroccan descent. Other reactions were more extreme, calling for Hitler to be brought back from the grave or for all "foreigners" to be deported from the Netherlands at once. Meanwhile, several websites for Dutch Moroccans were taken offline when people wrote in to express their approval of the killing. 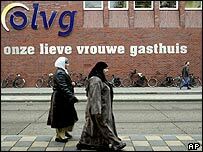 Dutch Muslim leaders such as Ayhan Tonca were quick to distance themselves from these extreme reactions, saying that even if they had found Van Gogh's films and newspaper columns blasphemous, Muslims "must strongly protest that this kind of assassination is not accepted by the Muslim community." A large number of Dutch Muslims were among the crowd protesting against the killing in Amsterdam's Dam Square on Tuesday, carrying banners with slogans such as "not in the name of my Islam". The government, meanwhile, appeared eager not to repeat the mistakes the main political parties had made two years ago, when they were accused of downplaying the importance of what had happened. Jozias van Aartsen, leader of the Liberal VVD Party, was one of the first to suggest a link between the Dutch Moroccan arrested for the murder and "terrorism." "Democracy is in danger," was Mr Van Aartsen's unambiguous comment. And Rita Verdonk, the immigration minister whose tough policies have proved increasingly unpopular with the Dutch public, was one of the main speakers at the mass demonstration in Dam Square. Still, the politicians will have to defend themselves against accusations that they closed their eyes to the rise of Islamic fundamentalism. A close friend and colleague of Theo van Gogh, columnist Ebru Umar, said she did not think the government would act even now: "This is the Netherlands, nothing will happen." And Somali-born MP Ayaan Hirsi Ali, who worked with Van Gogh on his controversial film called Submission, said it was an "outright scandal" that the government had not offered him better protection. Fortuyn's assassination in 2002 triggered a fierce anti-government backlash and the left-wing Labour Party saw its vote almost halved in the elections that followed. This time, with a right-wing government in power, the sense of disillusionment is even stronger, as many people feel they are running out of non-violent alternatives. "Van Gogh may not have survived," warned the Dutch daily De Stem, "but his dedication to freedom of speech should survive, and you cannot defend that freedom with violence against a whole group". The daily De Volkskrant meanwhile said Muslims "will have to accept that, in a democracy, religion, too, is open to criticism - this applies to Islam no less than to Christianity". "Theo van Gogh in this respect always purposefully went to the limits of decency. Many have regularly had reason to feel hurt or offended by him. In a democracy, those who want to defend themselves against this can go to court. Any other curtailment of free speech is inadmissible," it commented.